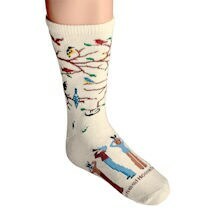 Socks for bird lovers of any stripe or feather. Amazingly detailed, from the tiny binocs to the leaf sprouting from the conductor's baton. Birdwatchers (XC5432-sold separately) on natural, Songbird Concert (XC5442) on gray. Cotton-nylon-spandex blend. Choose from Medium (ladies shoe size 6-9) or Large (size 10-13). Made in USA.